Winter Bison has been raising bison since 1991 and raises their bison hormone and antibiotic free. 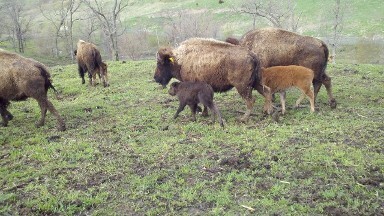 The bison are raised free range and are grass and hay fed. In their last 90 days they get a small amount of grain in with their diets to helps tenderize and sweeten the meat. All products and prices are listed below. Prices and product selection are subject to change anytime. Oxtail & Rocky Mountain Oysters 5.00 EA. Bison meat is a very lean meat, as a result, it cooks quicker. The golden rule is not to overcook. We like to instruct people, low, and slow, the rarer the better. Set oven temperature to 250 - 275 degrees and use a meat thermometer to check for doneness at 110 - 120 degrees. At this lower temperature your roast should take the same amount of time as beef is cooked at a higher temperature. High heat only for searing! Then turn the heat down. Remember Bison cooks faster than beef, don't overcook that steak! Watch your cooking time. After searing, low, and slow and plenty of moisture. Since Bison is so lean you'll need to keep it moist. It's a good idea to marinate these cuts of meat first, and make sure that the meat is basted frequently. Move your rack further away from the heat source. Broil as with beef, but shorten the cooking time. Turn the steaks a few minutes sooner and check for doneness. Following these few simple guidelines will ensure a tasty, mouthwatering product that you will want to serve again and again. *Bison Nutritional Information is from the USDA Handbook 8-5:8-10:8-13:8-17.